Economical kit perfect for trade show giveaways. Product Includes: 1 imprinted golf ball and 6 imprinted 2-3/4" tees Price Includes: 1 to 2-color PMS matched logo on ball and a 1-color, 1-location imprint, on tees. Tee Item Colors: Assorted Colors, Black, Blue, Dark Blue, Natural, Red, White, Yellow. Size : 5-1/2"w x 3-1/8"h x 1-1/2"d. Imprint Size: North Pole of Golf Ball, 3/4" dia., 5 color(s) max. Packaging: Bulk Pack Of: 200 Weight: 29 lbs. Another member of our Par Pack family. This one features 1 imprinted ball and 6 imprinted tees. Product Includes: 1 imprinted golf ball, 6 imprinted 2 3/4" tees. Price Includes: 1 to 2-color PMS matched logo on ball and a 1-color, 1-location imprint, on tees. Tee Colors: Assorted Colors, Black, Blue, Dark Blue, Natural, Red , White, Yellow. Size : 5"h x 1-3/4"dia. Imprint Size: North Pole of Golf Ball, 3/4" dia., 5 color(s) max. Packaging: Bulk Pack Of: 112 Weight: 20 lbs. 1 Top-Flite XL Golf Ball. 12 2-3/4" Wooden Tees. 4 Color golf motif on tube. Green, Blue, Red or Black caps. Price includes a one or two color, one pole imprint on golf balls and a one color ink imprint with your logo on 12 2-3/4" tall tees. Green cap is standard if not specified. Actual Size: 4-1/4" H Imprint Area: Ball: 7/8" Dia, Tees: 7/16" H x 1-3/8" W Tee Colors: White, Black , Blue, Green, Natural, Orange, Red, Yellow Golf Ball: White Packaging: 72 per box Shipping Weight: Approx. 21 lbs. per 112. 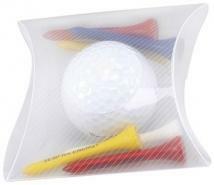 Our most popular golf ball event kit: 2 balls and 6 tees packaged in a clear plastic tube. Product Includes: 2 imprinted golf balls, 6 imprinted 2 3/4" tees. Price Includes: 1 to 2-color PMS matched logo on balls and a 1-color, 1-location imprint on tees. Tee Item Colors: Assorted Colors, Black, Blue, Dark Blue, Natural, Red, White, Yellow. Size : 6-5/8"h x 1-3/4"dia. Imprint Size: North Pole of Golf Ball, 3/4" dia., 5 color(s) max. Packaging: Bulk Pack Of: 95 Weight: 27 lbs. 3 Golf Balls Classic 4 color golf motif on tube Blue, Red, Green, Black caps Green cap standard if cap color is not specified Price includes a one or two color, one pole imprint on golf balls. Other golf ball models available; call for quote. Imprint Area: Balls: 7/8" Dia. Packaging: 72 per box Shipping Weight: Approx. 40 lbs. per 112. Neoprene ditty bag. 10 2-3/4" Tees. 2 Top-Flite XL Distance Golf Balls. Blank 5mm Carabineer. Price includes a one or two color, one pole imprint on golf balls, and your logo printed in one ink color on tees and ditty bag. Other golf ball models available; call for quote. Ask about pricing on Second Pole Imprints. Imprint Area: Balls: 7/8" Dia. 234T: 7-16" H x 1-3/8" W NDBC: 1-1/4" H x 4" W Packaging: Bulk Shipping Weight: Approx. 23 lbs. per 100. Another member of our Par Pack family. This one features 3 imprinted balls. Product Includes: 3 imprinted golf balls. Size : 5-1/4"h x 1-3/4"dia. Imprint Size: North Pole of Golf Ball (Standard): 3/4" dia., 5 color(s) max |Equator of a Golf Ball (Optional): 3/4" dia., 5 color(s) max |South Pole on Golf Ball (2nd Location) (Optional): 3/4" dia., 5 color(s) max. Packaging: Bulk Pack Of: 76 Weight: 28 lbs. The three golf balls in this Golf Ball Sock are right there on your golf bag when you need to reload. 100% polyester webbing Metal carabiner can be easily clipped on golf bag. Price Includes: 1 to 2-color PMS matched logo on balls and a 1-color, 1-location imprint on outer package. Material: Polyester sock, Ionomer golf balls. 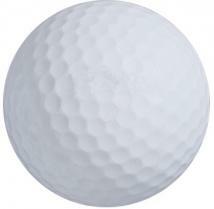 Sizes: 2-1/8"w x 7-5/8"h x 5/8"d Imprint Area: North Pole of Golf Ball (Standard): 3/4" dia., 2 color(s) max. Packaging: Bulk Pack Of: 76 Weight: 25 lbs. 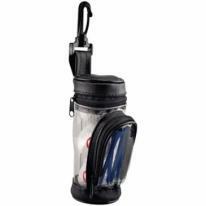 Miniature golf bag with 360 degree golf bag clip. Six 2-3/4" tees. 3 Top-Flite XL Distance Golf Balls. Ends searching for golf balls and tees. Great tournament favor. Other golf ball models available; call for quote. Ask about pricing on Second Pole Imprints. Item Colors: Bag: Clear with black trim Only, Tees: White, Black, Blue, Green, Natural, Orange, Red, Yellow. Imprint Area: Ball: 7/8" Dia. Packaging: Bulk. Individually poly-bagged Shipping Weight: Approx. 43 lbs. per 100. Another member of our Par Pack family. This one features 3 imprinted balls and 6 imprinted tees. Product Includes: 3 imprinted golf balls, 6 imprinted 2-3/4" tees. Price Includes: 1 to 2-color PMS matched logo on balls and a 1-color, 1-location imprint on tees. Tee Item Colors: Assorted Colors, Black, Blue, Dark Blue, Natural, Red, White, Yellow. Size : 8-1/2"h x 1-3/4"dia. Imprint Size: Pole of Golf Ball, 3/4" dia., 5 color(s) max. Packaging: Bulk Pack Of: 60 Weight: 24 lbs. 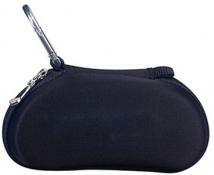 Keep those glasses or sunglasses scratch-free with this stylish neoprene sunglasses case. Materials: Jersey cloth, foam Price Includes: 1 to 2-color PMS matched logo on balls and a 1-color, 1-location imprint on outer package and tees. 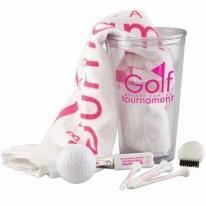 Product Includes: 2 imprinted golf balls and 10 imprinted 2-3/4" tees. Tee Colors: Assorted Colors, Black, Blue, Dark Blue, Natural, Red, White, Yellow. Product Size: 6"w x 3-1/4"h x 1-3/4"d. Imprint Area: North Pole of Golf Ball (Standard): 3/4" dia., 5 color(s) max. Packaging: Bulk Pack Of: 63 Weight: 22 lbs. Miniature replica of a golf bag makes this kit a fun and unique giveaway. Product Includes: 3 imprinted golf balls, 5 imprinted 2-1/8" tees. Price Includes: 1 to 2-color PMS matched logo on balls and a 1-color, 1-location imprint on outer package and tees. Tee Colors: Assorted Colors, Black, Blue, Dark Blue, Natural, Red , White, Yellow. 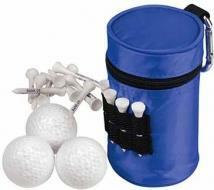 Size : 2-1/2"w x 5-1/2"h x 2"d. Imprint Size: North Pole of Golf Ball, 3/4" dia., 5 color(s) max. Packaging: Bulk Pack Of: 58 Weight: 25 lbs. Keep your canned beverage cool while saving par. Price Includes: 1 to 2-color PMS matched logo on balls and a 1-color, 1-location imprint on outer package and tees. Product Includes: 3 imprinted golf balls, 15 imprinted 2-3/4" tees. Tee Colors: Black, Blue, Dark Blue, Natural, Red, White, Yellow. Size : 5-3/8"h x 3"dia. Imprint Size: North Pole of Golf Ball (Standard): 3/4" dia., 5 color(s) max. Packaging: Bulk Pack Of: 40 Weight: 20 lbs. Varsity 16 oz Double Wall Acrylic Tumbler. 15" X 18" Golf Towel with grommet & hook. Four 3-1/4" Tees. Metal Bent Fork Divot Repair Tool Rubber Coated. Pocket Golf Club Groove Cleaner. 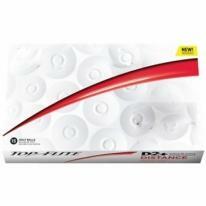 1 Top-Flite XL Distance Golf Ball. Price includes a one or two color, one pole imprint on golf ball with your logo printed in one ink color on towel, tees, repair tool, groove cleaner and tumbler. Item Colors: Towel: hite Standard. Substitute Black, Navy, Red or Green towel for $.20 per towel. Divot repair tool: Black, Blue, Green, Red, and White. Groove Cleaner: White, Dark Green, and Lime. Varsity Tumbler: Translucent Blue, Translucent Green, Clear, and Translucent Red. Tees: White, Black, Dark Blue, Dark Green, Natural, Orange, Red and Yellow. Imprint Area: Golf Ball: 7/8" Dia. 1518HW: 11" x 15" 314T: 7/16" H X 1-1/2" W BTL-R: 1/2" H x 1-1/4" W PGCGC: 5/8" Dia. 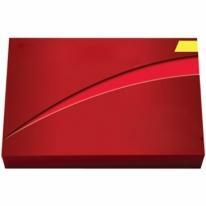 VARSITY:2 Side (standard) 2" H x 3-1/4" W per side Packaging: Bulk. Individually poly-bagged Shipping Weight: Approx. 53 lbs. per 72. Top Flite XL Pure Distance Golf Balls have an Afterburner Core to maximize distance. Titanium infused cover gives cut-proof performance Dimple distance technology helps the ball fly farther. Afterburner Core Technology provides an extra burst of power. Materials: Ionomer. Size : 7-1/2"w x 5-1/2"h x 1-3/4"d. Imprint Size: North Pole of Golf Ball (Standard): 3/4" dia., 5 color(s) max |Equator of a Golf Ball (Optional): 3/4" dia., 5 color(s) max |South Pole on Golf Ball (2nd Location) (Optional): 3/4" dia., 5 color(s) max. Packaging: Boxed Pack Of: 12 Weight: 19 lbs. 2 Piece construction. Large, high-energy core generates high ball speed to maximize distance over a wide range of swing speeds. Cut proof durability Price per dozen. Free plate charge. Imprint Colors: 1-5 Spot colors or 4 color process. Imprint Area: 7/8"Diameter. XL 7000 distance dimple technology provides high surface area coverage for maximum performance. Soft core for better feel off the clubface. Hot ionomer cover generates low spin off the driver to maximize distance. Size: 7-1/2"w x 5-1/2"h x 1-3/4"d Imprint Area: North Pole of Golf Ball (Standard): 3/4" dia, 5 color(s) max. Packaging: Boxed Pack Of: 12 Weight: 19 lbs. Generates legendary Top-Flite distance Promotes high speed with low spin and cut-proof durability High surface area coverage delivers consistent performance Price per dozen Imprint Area: 7/8" Diameter.